The seal was set on his absolution by Hannah Arendt, in a birthday address broadcast on West German radio. Heideg­ger’s Nazism, she explained, was an “escapade,” a mistake, which happened only because the thinker naïvely “succumbed to the temptation . . . to ‘intervene’ in the world of human affairs.” The moral to be drawn from the Heidegger case was that “the thinking ‘I’ is entirely different from the self of consciousness,” so that Heideg­ger’s thought cannot be contaminated by the actions of the mere man. One of the most secret forms of the gigantic, and perhaps the oldest, is the tenacious skillfulness in calculating, hustling, and intermingling through which the worldlessness of Jewry is grounded. As chairman of a society, which is named after a person, one is in certain way a representative of that person. After reading the Schwarze Hefte [Black Notebooks], especially the antisemitic passages, I do not wish to be such a representative any longer. These statements have not only shocked me, but have turned me around to such an extent that it has become difficult to be a co-representative of this. Whether or not this new evidence will cause more of his adherents to renounce his work remains to be seen, but the notebooks, writes Peter Gordon, will surely "cast a dark shadow over Heidegger's legacy." A very dark shadow. Pretty irresponsible headlining, to place anti antisemitism at the “heart” of heidegger’s philosophy when in the article itself, examples of his antisemitism all constitute effectively excluding Jews from the core of his philosophy. This isn’t to say these new notes aren’t evidence he was an antisemite; it sounds like he really was. But they’re also just as far from demonstrating how his philosophy itself is rife with Nazi sensibilities as previous publications to that effect have been. If you want to argue that a philosophy is antisemitic, then make it a philosophical argument. The defense I’d give is probably the exact same defense any Heidegger ‘apologist’ might have given were these notebooks never published: If Heidegger meant what he said about the Jews, then he really must not have had them in mind when forming his philosophy of human beings. So it doesn’t obviously follow that his philosophy of human beings is itself antisemitic. Go ahead and be suspicious of a formulation of humankind drafted up by the kind of person who was willing to cast certain groups of people aside. I know I am. But no self respecting Heidegger fan is going to suddenly think they’ve been suckered into a Nazi philosophy; that’s just ridiculous. 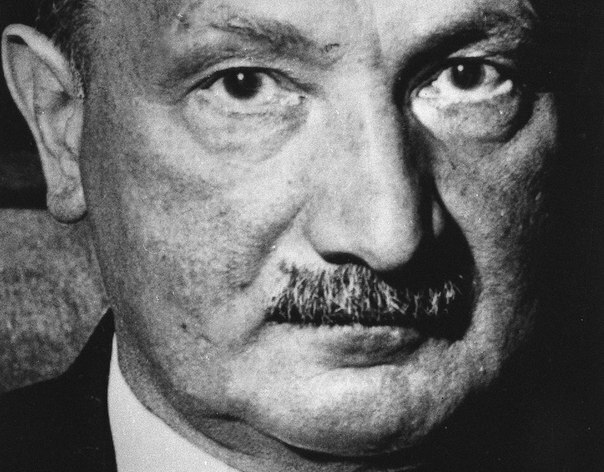 Heidegger’s notes on Jews may not be “politically correct” but they are far from showing that Heidegger was a ruthless Nazi thug, that would enjoy eradicating all Jews. He maybe didn’t like Jews, that doesn’t mean he would prefer them dead. On the contrary, he referred to Nazis as “murderers” in private conversations. His notes are “obscure” because everybody accusing Heidegger of being a Nazi has no comprehension of his philosophy. He was in the Nazi party from 1933 to 1934, when its leader’s intentions were not as clear, and I’m sure he would have never accepted to exterminate an entire human race. Criticizing Jews does not make you an anti-Semite, inasmuch as criticizing French or German people does not imply that you wish to exterminate them. As long as he didn’t call for, or participate in, total murder, who cares? Why goyim bow to their “masters” is beyond me. No religion or religious group deserves the kind of protection given to Jews. Can’t say a single thing in criticism of Jews for fear of being labelled a . . . ? No way. My question is this: what is it called when Jews openly spout hatred for, say, Muslims? BubVeb, I realize I’m wasting my breath responding to you, but I will do it anyway. But very briefly. The point is that no racism should be tolerated. If a Jewish intellectual were to make anti-Muslim remarks, we’d condemn it. If a German philosopher blames the Holocaust on the Jews, it should be condemned too. It’s anti-semitism pure and simple. If that’s not, then what is? I think most of the people responding here get that, even if they’re taking issue with some parts of the post. You either seem to think that one set of racist comments justifies the other, or you’re just fine with these chilling remarks. Bottom line is that your arguments seem to be made in bad faith.Normally I delete bigoted comments. But I will let it stand. It’s just a reminder of what’s out there. Nowadays we trend to judge artist, philosophers, writes, scientists like they were politicians. You can ask politicians for self-consistency between their ideas and their actions, you can’t do the same for other categories of people, including philosophers. He based the notion of being on our ways of doing things as they emerge within a culture or tradition. Arguably it included the ways of doing things in Germany in the 1920s and 30s; to be a human was to be a nazi. Tell that to these people. It’s a fairly long, and certainly incomplete list, of people who managed to think otherwise. To be a Nazi was a way of being human, rather. I think it’s a fairly common and reasonable criticism of Heidegger that his philosophy isn’t a good jumping off point for morally condemning the Holocaust. I think Habermas said something about this but I may be wrong. As far as I’m concerned, this isn’t that interesting. I couldn’t tell if you were trying to twist Heidegger’s thing into a promotion of the Nazi way of life, but if you were I think it’s more accurate to say his philosophy constitutes no more than a kind of vacuous defense of it, as simply being one locus of human practices among others. @Dan: so, obviously his notion of ‘being’ was absurd. @Simon: sure, nazism was one of many human practices. The real problem, however, is that he based ‘being’ on human practices. But being human, for instance, by virtue of nihilating humans, as in genocide, is absurd. Like his obfuscatory interpretation of nothing as something positive. Bitter examples of philosophy gone very wrong. A philosophy of human beings that excludes Jewish people isn’t obviously anti-Semitic? Really? I fear I must be misunderstanding you, or whether that is intended to be a serious argument.